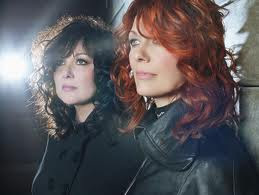 In a performance that had Robert Plant on the verge of tears, Ann & Nancy Wilson of Heart sang ‘Stairway to Heaven’ as the finale of a star-studded musical tribute to Led Zeppelin during the Kennedy Center Honors, which were broadcast last night (Dec. 26) on CBS. It seems like about 3,000 people were on stage during this performance, with the Wilson sisters joined by late Led Zeppelin drummer John Bonham’s son Jason on drums, as well as a gigantic house band featuring string and horn sections and what appeared to be two different vocal choirs. As anyone who’s seen their frequent live performances of ‘Rock and Roll‘ or ‘The Battle of Evermore‘ can tell you, the Wilson sisters know how to play Led Zeppelin live. From the moment they began, all eyes and ears were focused on Ann Wilson, and she knocked this one out of the park, leaving John Paul Jones, Jimmy Page and a clearly misty Plant with big smiles on their faces as they watched from the balcony.